Dance has an important place not only in the festivals and festivities of Solapur, but also the entire Solapur culture. Most of the dance forms are related to temple festivals in Solapur. The dances are an integral part of most of the festivals here. The two most popular dance forms of Solapur are Lavani and Dhangari Gaja. Lavani is a famous folk dance in Solapur, which is accompanied by traditional song. The dance is performed according to the beats of Dholak, which is a drum like instrument and lavani is presented mainly by women. 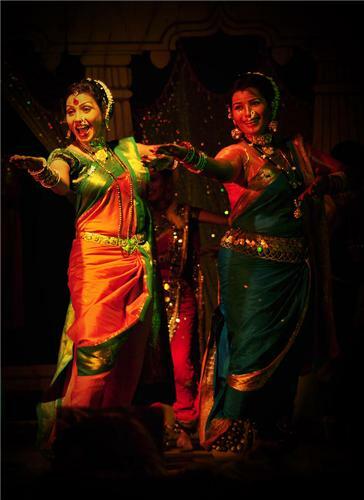 Women need special training to perform this dance with such elegance by being draped in heavy nine-yards sari. While lavani is performed to highlight different aspects of the society such as politics, religion, romance etc in the earliest days, it became an entertainment as well as motivation for the Maratha soldiers who fought several battles in 18th and 19th centuries. Today, lavani can be seen in many important events of Solapur. Dhangari Gaja is a popular dance form of Solapur. Dhangars, which is the community of shepherds belonging to the Sholapur district of Maharashtra, generally perform this dance form. The life of Dhangari Gaja is related to nature and its various forms and so their poetry, which accompanies Dhangari Gaja, reflects the same. These poetries, which are made up of couplets, tell the tales of the birth of their God ‘Biruba’ and ‘Ovi’. Appeasing the Gods is the main motive of performance of Dhangari Gaja. Men wearing Dhoti, Pheta, Angarakha and colorful handkerchiefs perform this dance to the beats of drums.